Larry King's days are officially numbered at CNN, although he'll be sticking around a bit longer than initially anticipated. The all-news network officially named Britisher Piers Morgan as King's replacement Wednesday. He'll begin hosting a "candid, in-depth newsmaker interview program" on a still to be determined date in January while King, 76, will be signing off on Dec. 16th after a quarter-century at CNN. King's departure date wasn't specified in the official CNN publicity release. But network president Jon Klein disclosed his mid-December exit in a memo to staffers while also describing Morgan, 45, as "the tough but playful judge" on NBC's America's Got Talent, which will retain his services. 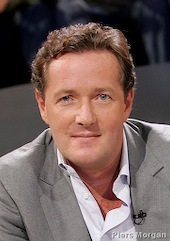 Morgan also is known in his native United Kingdom as the host of Piers Morgan's Life Stories, an interview program. "We are delighted that he will now bring his dynamic, probing interview style to American television and to CNN viewers around the globe," Klein told staffers. King's name was mentioned just once -- by Morgan -- in CNN's companion publicity release. 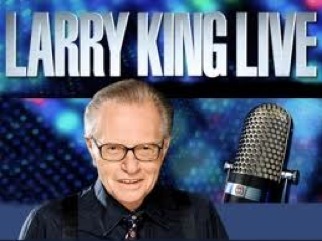 "I have watched Larry King Live for much of the last 25 years, and dreamed of one day filling the legendary suspenders of the man I consider to be the greatest TV interviewer of them all," Morgan said in a statement. Morgan's CNN program will air in King's old 8 p.m. (central) spot, sandwiched between Anderson Cooper 360 at 9 p.m. and an upcoming 7 p.m. program to be co-hosted by former New York governor Eliot Spitzer (who resigned over a prostitution scandal) and conservative commentator Kathleen Parker. Klein described Morgan as a "natural fit" with Cooper and company, and "the ideal choice to update the storied tradition of newsmaker talk on CNN." CNN has been in the throes of a ratings slump that has the original all-news network trailing both Fox News Channel and MSNBC in prime-time. Morgan, also a winner of Donald Trump's Celebrity Apprentice, will continue to write two weekly columns for London's The Mail on Sunday newspaper, one on sports and the other a "diary of his life," CNN said. He'll also contribute to cnn.com.